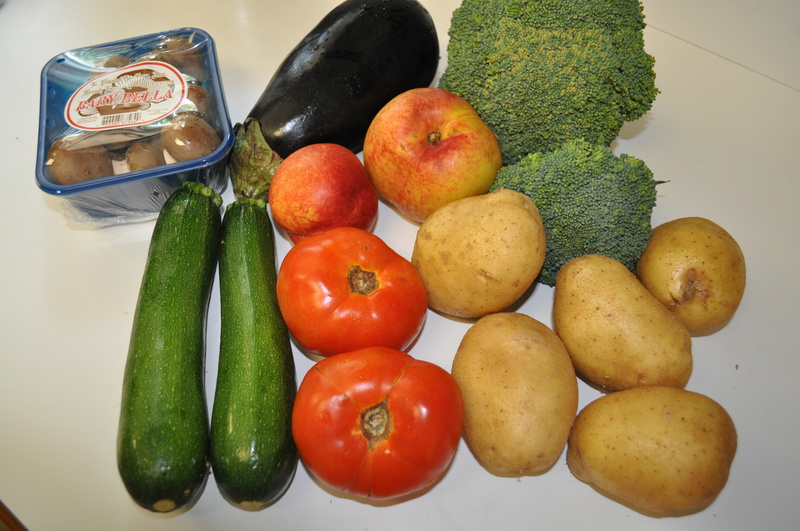 One of the side benefits of getting the Friends and Farms basket is the advance notice which lets me meal plan. About one week in advance the notice is updated on the What’s in the Basket page. With this information, I begin planning what to do for lunches and dinners. Like this past week. I knew we were getting Coho salmon. I planned tonight’s dinner to use it. I will be doing crock pot short ribs Tuesday night, since I will be out most of the day. Crock pot meals work well around here. Eggs, already there was a frittata last night. Why? 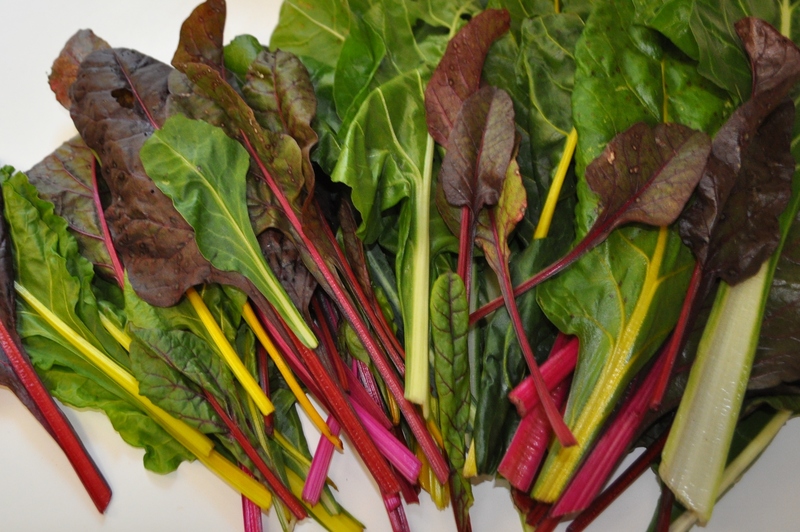 Because of this lovely rainbow chard I am still getting from my garden. 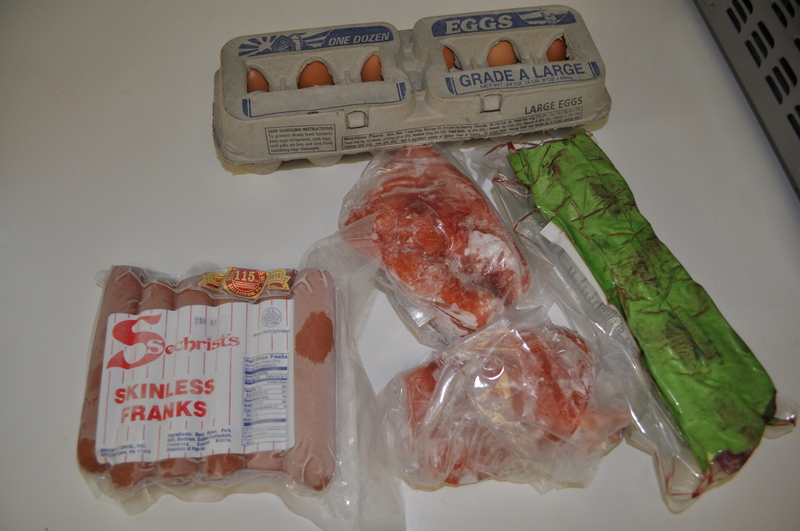 The other protein item pictured above came from the available items listed at our pick up site. The office in Columbia. I wanted to try the hot dogs for an upcoming picnic. They are from the main meat supplier to Friends and Farms. Wayne Nell and Sons. They sell Sechrist Brothers all beef hot dogs. As for the rest of my basket, here is most of it. Everything is there but the arugula, Which was off to the side and I forgot about it. Found it later. Thankfully hydroponic arugula can be revived easily. Just add water. The broccoli is destined to be steamed for dinner tonight. The mushrooms, with CSA bok choy and chicken will be stir fried. The potatoes already became potato salad to use with the hot dogs. The eggplant, with the red bell peppers I got from the CSA will become my ajvar, to use for those quick dinners where I spread it on flatbread and grill it. The tomatoes, sliced to be the salad with dinner tonight. And, the zucchini will become fritters tomorrow night. To serve with the chicken I made the other day. I bake all the chicken breasts I get and plan meals around them. Maybe a chicken Caesar salad. Or the upcoming stir fry. I get three or four dinners a week from my basket. I also get dinner to the table quickly by doing that bulk cooking in advance. Like Thursday when we got home late. A quick bake of a frozen flatbread. A slather of ajvar and a sprinkling of goat cheese. A green salad on the side. Voila. Dinner. Posted in Food, Friends and Farms, Gardening, Locavore, Real Food and tagged cooking, crock pot cooking, Food, gardening, real food. Bookmark the permalink.